Well, my twelve weeks of maternity leave end after tomorrow. I’m not taking enough photos of S. It’s been over a week and a half since I took one. 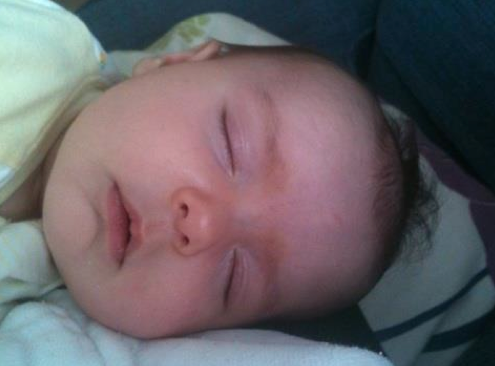 Oh no, wait, I took one Friday when she was 12 weeks old, snoozing in my arms on the couch. This time has just flown by, although it seems like it’s been forever since I was at work. I think the hardest part of going back is that this really feels like real life right now. This routine is working and comfortable and lovely. It’s too bad it’s unpaid. I think it’s so much easier to enjoy this time around, because I know how fast it goes and how quickly they grow. I’m not super anxious about her being away from me – I know she’ll be ok. I’m not super anxious about going back to work – I know I like my job and the people I work with. I think the thing I am most anxious about is how in the world I will a) make it to work on time and maintain some level of personal hygiene, b) ever get anything done and c) really have time for both kids while working. I know the later while be easier once they are a bit older and we can all do things together. I’m also a bit anxious about how the pumping thing is going to work out. I think it will be fine, but it’s just something new and different I’ll have to figure out. Luckily, I’ve got a couple of really awesome kids. S has even slept through the night several nights – three of which were IN A ROW (by 11 weeks old)! I don’t think we starting counting nights in a row until M was 5 months old. I love keeping a blog. I don’t go back and read often, but it sure is a nice way to remember when something happened and also to read up on where we were with M at certain ages. Interesting to read the post I wrote right before going back to work last time around. I know it will all be fine and we’ll get into a new routine, but any change is always scary to me. This entry was posted in Miss S., Motherhood. Bookmark the permalink.